« How To Go Veg Without Going Crazy: Article 3. Scientists and the Whole Food Plant-Based Diet. Ahhh, who doesn’t love baked goods? Especially those that are rich in flavor, comforting, and don’t require a degree in culinary arts to make? Lo and behold today’s leading character – my Banana Nut Bread! And then I switched to a vegan diet. Ta da! Before I did any research, I was worried that I’d never get to bake anything again… But I decided to be stoic, especially since I realized that all those eggs and butter in all of my favorite baked goods and pastries were no good for our health. After some poking around on Pinterest, boy was I surprised! It turned out that there is a whole new world out there – the world of vegan baking! As soon as I stocked up on some vegan pantry essentials, I started testing out the newly discovered recipes, and they turned out surprisingly delicious! So tasty, in fact, that now I don’t understand why people bake the non-vegan stuff! And that’s not an exaggeration: no one needs all of the fat and cholesterol of butter, eggs, and shortening (this one’s the worst! ), and no one definitely needs to feel guilty about eating their dessert. Another bonus of the vegan baked stuff? You can have just one cookie/slice of pie/cake/banana bread to be completely satisfied! Your body will process all the nutrients (yep, this stuff has them!) and won’t send you to the kitchen for another serving. Okay, not all vegan baked goods are created equal. I only go for recipes that require minimum amounts of processed/refined ingredients (better – none at all) so that this occasional indulgence doesn’t feel like I’m going against all of my dietary principles. Beware of vegan recipes that call themselves vegan because they’ve substituted butter for ‘vegan butter’! That’s highly processed stuff, and you don’t need it! Finding great-tasting recipes that call for no oil is another subject. A lot of recipes call for some type of it, be it olive or coconut oil. If you dig deeper in the research of whole food plant-based (WFPB) diet, you’ll come across plenty of evidence that oil is no good for you. 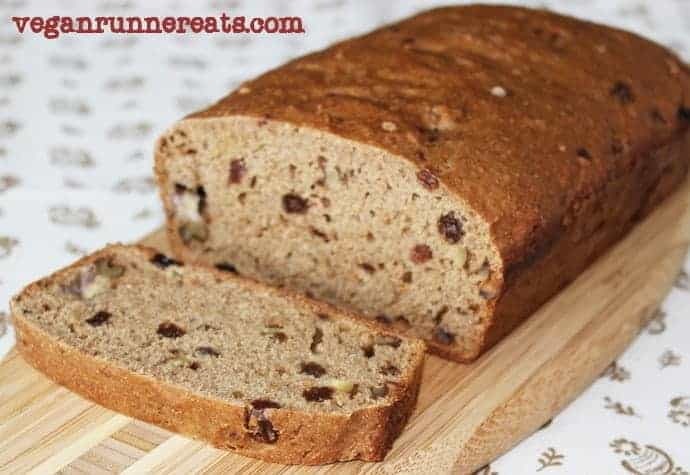 I’ve been looking for a good recipe for banana bread – the kind that could make a nice anytime treat, or a quick breakfast without weighing you down or sending you in a sugar overload. I’ve seen lots of recipes that call for some type of oil, or a bit too much refined sugar. I searched through WFPB sites to see what they had, and finally, after combining a few ideas from a few different recipes (kudos to Happy Herbivore! ), I arrived at this one. This banana-raisin-walnut bread is moist, dense, and full of flavor. It’s not too sticky and doesn’t crumble all over the place – not like some commercial banana breads I tried before, although some people might prefer that texture. You can feel good about eating it as it has only good-for-you ingredients and none of the highly processed/refined stuff. Feel free to go beyond raisins and walnuts – any dried fruit and/or nuts should work well. Preheat oven to 375°F. Slightly grease a loaf pan (not necessary if using a good non-stick pan). Mix together almond milk and lemon juice, stir until almond milk separates. Combine all wet ingredients in a large bowl, mash and stir together until homogenous (alternatively, pulse in a food processor). Combine all dry ingredients in a small bowl, stir well. Add all wet ingredients and almond milk-lemon mix to dry ingredients, stir until just combined. Fold in chopped walnuts and drained raisins. Pour batter into the prepared loaf pan. Make a dome out of aluminum foil and loosely cover the pan. Bake for 45 min, remove the foil dome, and bake for another 10-15 min, or until a toothpick comes out dry and clean. Let cool in the pan for 15 min or more before removing. Tagged baking, cinnamon, dessert, vegan breakfast, walnuts. Bookmark the permalink.